The pop-up ice rink at Philadelphia’s Dilworth Park casts a warm glow on chilly winter days and nights. Rothman Orthopaedics Ice Rink at Dilworth Park will open for the 2018 season on Friday, Nov. 9, at 6:30 p.m.
To celebrate, there will be ice sculptors, snow, firework effects, fire performances and figure skating at the rink outside City Hall. Rothman Orthopaedics Ice Rink will be open daily this holiday season through Sunday, Feb. 24. Admission is $3 for children 10 and younger, and $5 for adults. Skate rental is $10 per person. Temple University staff and students receive $1-off admission with presentation of their Temple University ID. 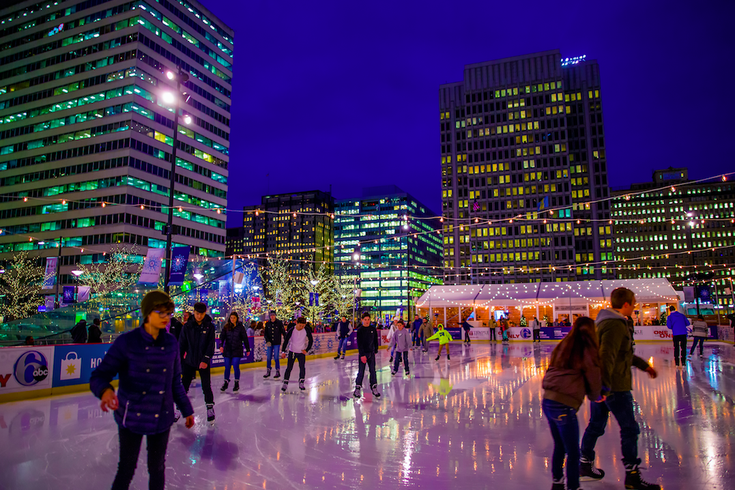 Mondays through Thursdays: Noon to 9 p.m.
Fridays: Noon to 11 p.m.
Saturdays: 11 a.m. to 11 p.m.
Sundays: 11 a.m. to 8 p.m.
Next to the rink is the Rothman Orthopaedics Cabin, where skaters can warm up with food and drink. There are cocktails, cider and craft beers for those looking to imbibe. The cabin also hosts Quizzo on Tuesday evenings and "Cocktails and Cold Ones" happy hour on Wednesdays.